To discuss the new season of her show, Sonequa Martin-Green attended the Paley Center For Media's 2019 PaleyFest LA Presentation of 'Star Trek: Discovery' at the Dolby Theater yesterday(March 24th) in LA. 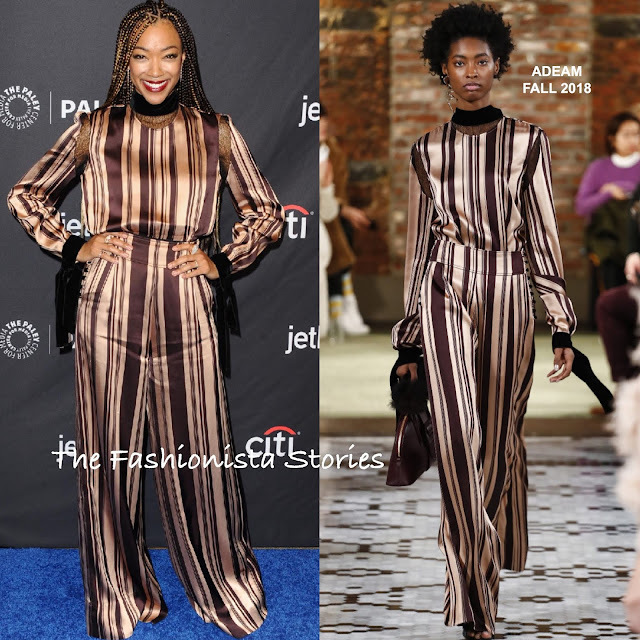 Stepping into the pajama trend, she wore an ADEAM FALL 2018 dusty rose & Bordeaux lace trimmed stripe top and the matching side button, wide-leg pants. Two things hurt her look here, the unfortunate creases and the un-hemmed pants. I can't say that I am crazy about the ensemble either way but kudos to her for taking on the playful striped look. Beauty look is flawless though. Are you feeling Sonequa's stripe pajama set?